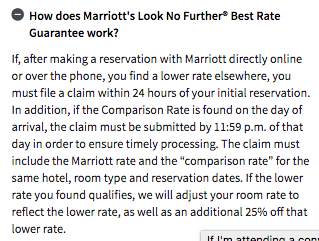 All you need to do is submit a claim after making the reservation through Marriott’s system is to file a claim on this website. Now, be warned, if the exact type of room is not available on the 3rd-party site this policy does not come into play. In other news, I just got the last Sapphire Preferred Trip Interruption claim filed and approved for our honeymoon over the summer after having to call back Broadspire (the company that supports this type of insurance). I had submitted two claims: one for a hotel room and one for airline tickets. The hotel night was approved quite quickly but the airline tickets were not because apparently I didn’t submit the correct documentation. This confused me since I uploaded the same documentation for each claim so I called Broadspire up today and spoke with my adjuster. He briefly looked over the claim, talked to his manager, and then approved it based on the other approval. He was quick to state that this was a courtesy that would not be extended a second time, however, so I should make sure to get a physician’s note in the future.